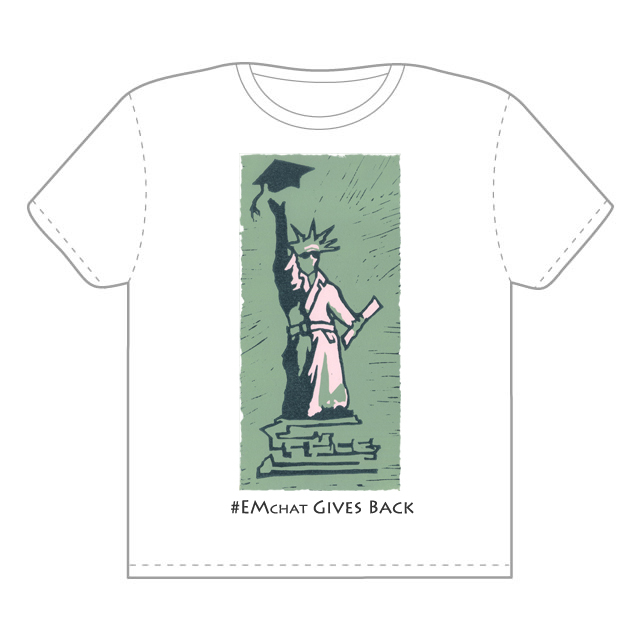 Two weeks ago we announced the #EMchat Gives Back initiative. We've had an overwhelming response of support since that night. And, we've learned A LOT about planning a fundraiser from scratch--thanks for sticking with us! After finalizing our Third Party Fundraising Agreement with the Red Cross and setting our #EMchat Gives Back account up with PayPal, we're finally ready to begin fundraising! Joseph "JD" Dalfonso worked with Bradley University senior Studio Art major, Anna Celander, to design our t-shirts--and they've done an awesome job! We will have 100 shirts printed and are offering them to the higher ed community (and any community, really) for a donation of $20. The back of the shirts will include the Red Cross logo as well as the logos of our amazing partners who have completely underwritten the costs associated with printing, packaging, and shipping. In no particular order, a huge thanks to Hobsons, Noel-Levitz, Carnegie Communications, and NAGAP. We couldn't have done this without their support. Because of them, we're able to donate 100% of the proceeds from this fundraiser to the Red Cross Disaster Relief Fund. As we're geographically distanced, the easiest (and most secure) option for us to raise funds is via PayPal. Realizing that PayPal takes a portion of all transactions, Jennielle and I have decided to cover the ~4% from each donation in addition to our own. While we're offering the shirts for $20, please feel free to donate any amount. Please make sure you "add special instructions" with your shirt size on the PayPal order form. If you have any issues with the button, shoot an email to alex@emchat.net to see how we can resolve it! This fundraiser will run until December 4th. On this date, we will write one check from our #EMchat Gives Back account to the Red Cross. Donors will receive a tax receipt from the Red Cross after January. We will also place the order for the t-shirts to ensure that we have the correct sizes. Depending on the delivery of the shirts, we hope to have them out by the end of the month or early January...please remember that we're in holiday season, too! Thanks in advance for your support as we come together as a community to raise funds for all those affected by Hurricane Sandy!